Home Theaters are becoming more common as the technology has improved and the cost has become more affordable. It’s a great way to spend quality time with family and friends in a controlled environment where you choose the movies, music, showtimes, and the snacks. Home Theaters can be customized in any way, catering to a wide variety of spaces and budgets. With a well designed system, a Home Theater can add value to your home and provide a venue for exciting entertainment for years to come. 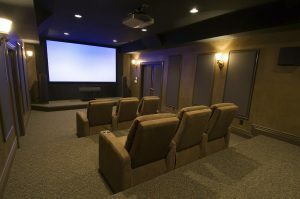 ITG will work with you to design the Home Theater of your dreams!